While shooting pre tied ceiling clips to a concrete ceiling is one of the fastest ways to suspend grid wire or pencil rod, there are times when you are not allowed to shoot by the management of the facility or because of the make up of the concrete. In this application, using a tie wire wedge anchor will fit the bill nicely. A tie wire wedge anchor is very similar to a standard wedge anchor that you would use to bolt racks and other equipment to a poured concrete floor. Instead of a threaded stud, you are left with an eye that you can fasten jack chain or ceiling grid wire to. Installation is simple, just drill a 1/4″ hole, hammer in the tie wire wedge and give a tug. One advantage a tie wire wedge anchor offers over shooting is more holding power and a sure set every time. Tie wire wedge anchors are available pre tied with to both 4′ and 6′ ceiling grid wire. With our ODM overhead drill machine, you now have the luxury of installing these anchors from the floor! Check out the video at our site. Next time you can’t use your Ramset or Hilti tool for shooting up grid wire, check out the easy to use tie wire wedge anchor. Drop in anchors are a common anchor in most trades for fastening to solid concrete. For most applications the standard length drop in type anchor works well. However there are situations that require shallow embedment or mini drop in anchors. The most likely situation is post tension concrete. Fastening to post tension concrete requires caution due to the tensioned cable below the surface. Most situations allow you to drill up to 3/4″, ruling out standard drop in anchors. 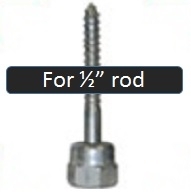 Shallow embedment or mini drop in anchors are available in 1/4″, 3/8″ and 1/2″ sizes. These anchors will fully set at 3/4″ embedment making them a great choice when you are limited in drill depth. It is recommended that you use what is called a stop bit while drilling for these anchors. These bits have a collar on them preventing them from drilling the hole deeper than allowed. These bits are actually a great time saver in that they prevent you from drilling your hole deeper than necessary. If you over drill your anchor hole by just a quarter of an inch, that would mean you are drilling the equivalent of one extra hole every 3 holes! If you are using a cordless SDS rotary hammer, this can drop your hole count per charge by 25%. These bits are also available for you standard drop in anchors as well. As a contractor it is your responsibility to make sure you are allowed to drill in the post tension concrete. If 3/4″ drill depth is permitted, then the min drop in or shallow embedment anchor is a great problem solver. 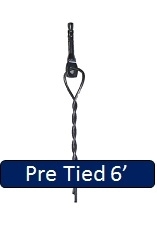 If you are using the Caddy’s® 2FMP28 multi clip for bridle rings, you know this is a very versatile clip. Not only does the 2FMP38 accept 10-24, 1/4-20 and smooth shank bridle rings but it will hammer on securely to any 1/8″ to 1/2″ flange. The design allows you to turn your bridle ring a full 360 degrees. Add a jam nut on the bridle ring if you want to lock the position of the ring on the 2FMP28. This clip teams up well our generic bridle rings or our bridle rings with saddles. This clip also lends itself to use with our 2″ bridle ring with angle bracket. Simply hammer on and add j hook with a short 1/4-20 screw. Our version of the Caddy® 2FMP28 is part # HOKFMP and comes packed 50 per box. The Sammy Super Screw has been on the market for quite some time. You have likely seen them being used by any trade suspending rod from the ceiling. You will find similar products like the Powers Vertigo, Simpson Titen Rod Hanger, Elco Hangermate and others. While the most common size is 3/8″ we are now stocking them for 1/2″ threaded rod. These are perfect for when you need a little more than a 3/8″ rod. For wood we stock both the Sammy Super Screw GST2 (ITW Buildex #8013925) and the GST3 (ITW Buildex #8015925). The Sammy Super Screws for 1/2″ rod are available for concrete and steel. We are a full line Sammy Screw dealer so if you don’t see what you are looking for, give us a call. Hilti and Ramset tools have been a great asset to many trades including the data comm field for hanging cable hooks. Overhead fastenings can be a challenge in some concrete. If your having trouble with low success rates when shooting ceiling clips into the concrete deck above, the problem many times can be traced back to the quality of your pin. Most tool supply houses and even the big box stores offer pins and loads for Ramset and Hilti tool. The problem is, many are stocking the cheapest pins available to maximize sales and profit. The result is that when you run into brittle concrete or pre cast decks, you can have a lot of blow outs. If you are shooting up a ceiling clip with pre attached, every failed fastening can start to add up. If you are having more blow outs than you like, or you are getting a lot of fish hooked pins, consider a ballistic point pin like the Ramset SPC78 and Ramset SPC114 series of ceiling clips. These clips are assembled using a polished point pin rather than a standard “pinched” point. See the pictures, there is a difference. Add to that the thicker shank on these ceiling clips and you will see fewer blow outs and less fish hooking of your pins. The SPC114 pin has an even thicker shank than the SPC78 and while you may not be able to sink it all the way, get it in 3/4″ and you will have a solid support for your light fixtures and cable hooks. For even better success, use a Ramset or Hilti tool made just for overhead work like the Ramset Viper 4.